VSECU is committed to helping members make smart investments in their homes and communities. 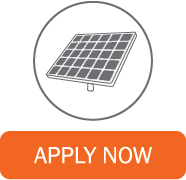 We’ve teamed up with Solaflect to offer special discounted rates to maximize your solar investment savings. No-cost loan modifications are available. Apply tax credits and other incentives to lower your loan principal. This special feature further reduces your costs and maximizes your energy savings. Contact the Solaflect team to get started. VSECU will work with you to help make your financing a smooth and worry-free experience. Contact a VSECU consumer lending consultant at lendingconsumer@vsecu.com or (802) 371-5146 for more information. This loan is for purchases eligible for the 30% Federal Investment Tax Credit. After the first 15 months, you may apply your tax credit to the principal of your VGreen ITC Loan, or you may use the credit to pay down higher interest debt and let your ITC Loan payments re-amortize to a higher monthly payment at same fixed rate. Annual Percentage Rate. APR is effective as of 1/1/2018 and reflects the current minimum APR offered. Payment amount subject to change after initial 15-months based on tax credits or other credits applied to principal or re-amortization of the outstanding balance. As an example, a $20,000 loan at 3.99% APR would result in 15 initial monthly payments of $125.27. If the entire 30% tax credit is applied to the principal during the first 15 months, the monthly payment would remain at $125.27 for the remaining term of the loan. If the principal is not paid down with a tax credit or other payment, the outstanding loan balance at the end of the 15-month period will re-amortize to $182.30 per month for the remaining 129 months. Other rates and terms may be available. The APR may be adjusted based on individual credit standing and term. Example payments are for estimation purposes only. Actual loan payment amount will be disclosed at loan closing and may differ slightly. APPLY: You can apply for most of our loan products online. Our online loan application offers quick results, sometimes letting qualified applicants know of approval instantly. This loan comes with options and levels of discounts and terms. Contact a VSECU consumer lending consultant at lendingconsumer@vsecu.com or (802) 371-5146 with any questions. QUICK TIP: If you are already a member and want to apply for a product online, it’s easier to apply once you’ve logged into our Online Banking system. That way we can save you time by pre-filling the application with the general information we already have on file for you.